This discussion is a novel piece of investigations now and earlier published in the Proceedings of the National Academy of Sciences, and another in Nature pertaining to aging, longevity, and cancer. The blind mole rat has an unexpected lifespan compared to other rodents. There are also findings of a related naked mole rat that comes into the picture. They are related, but not exactly the same. In both cases, the moles are cold-blooded, live underground with a queen and workers and they don’t develop cancer. The naked mold rates don’t develop cancer because of the presence of an imbalance in the intercellular matrix caused by abundant naturally produced, sticky complex carbohydrate also found in human joints that repels the cells at their interstices. This is fascinating because it is also an important aspect of joint mobility. In the situation of chondomalacia before erosion of the articular cartilage, the movement and shearing stresses initially induced production of more chondrocytes and with that, a thickened cartilage that becomes taxed until it loses matrix fluid, followed by loss of matrix and loss of collagen by shearing stress. This type of motion and shear stress plays no part in the life of the naked mole rat, which has a rough skin. The property of the cellular matrix seems to be characterized by both the production of the intercellular goo…called hyalurenan (like hyaluronic acid) and sparse hyaluronidase to remove and remodel the cell architecture. How this is related to extreme aging and no loss of cellular growth control, having sparce ubiqitination that is involve in cell death and repair is unclear. 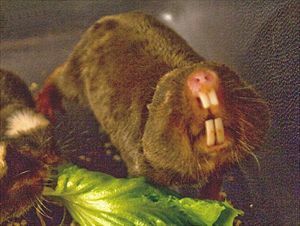 The blind mole rat is closely related, but it differs in that it has a mechanism by which the cells have limited proliferation and don’t proliferate to the point of getting out of control. This is because after several generations of cellular proliferation they produce a protein, IFN-β. This protein induces massive apoptosis, limiting the size of the sell population. There are findings in these investigations that might be relevant to understanding cancer resistance, and perhaps it could provide clues to treatment approaches. If that is too much to ask for, it gives us great insight into how cells organize. Gorbunovaa V, Hinea C, Tiana X, Ablaevaa J, Gudkovb AV, Nevoc E, and Seluanova A. 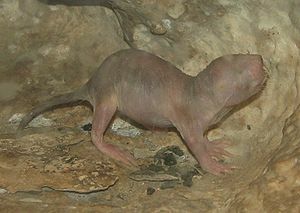 Blind mole rats Spalax (BMR) are small subterranean rodents common in the Middle East. BMR is distinguished by its adaptations to life underground, remarkable longevity (with a maximum documented lifespan of 21 y), and resistance to cancer. Spontaneous tumors have never been observed in spalacids. To understand the mechanisms responsible for this resistance, we examined the growth of BMR fibroblasts in vitro of the species Spalax judaei and Spalax golani. BMR cells proliferated actively for 7–20 population doublings, after which the cells began secreting IFN-β, and the cultures underwent massive necrotic cell death within 3 d. The necrotic cell death phenomenon was independent of culture conditions or telomere shortening. Interestingly, this cell behavior was distinct from that observed in another long-lived and cancer-resistant African mole rat, Heterocephalus glaber, the naked mole rat in which cells display hypersensitivity to contact inhibition. Sequestration of p53 and Rb proteins using SV40 large T antigen completely rescued necrotic cell death. Our results suggest that cancer resistance of BMR is conferred by massive necrotic response to overproliferation mediated by p53 and Rb pathways, and triggered by the release of IFN-β. Thus, we have identified a unique mechanism that contributes to cancer resistance of this subterranean mammal extremely adapted to life underground. 1To whom correspondence may be addressed. E-mail: vera.gorbunova@rochester.edu, nevo@research.haifa.ac.il, or andrei.seluanov@rochester.edu. 2Present address: Department of Genetics and Complex Diseases, Harvard School of Public Health, Boston, MA 02115. The extraordinarily durable proteins in the world’s longest-lived rodent may contain a vital piece of the puzzle of aging. Like short-lived mice, the cells of naked mole rats are suffused with free-floating, cell-damaging oxygen free radicals. Unlike the mice — and every other species that appears compromised by oxidative deterioration, including humans — they’ve found a way to live with it. The findings, published Monday in the Proceedings of the National Academy of Sciences, represent a new wrinkle in the oxidative-stress theory of aging. According to the theory, mitochondria — cellular machines that produce our bodies’ energy — pump out highly reactive oxygen molecules during respiration. Called free radicals, these molecules bind easily with other molecules, including DNA. Over time, DNA breaks down, compromising cellular function. Eventually whole tissues and organs no longer function. Multiple studies have found evidence of mitochondrial malfunction in a range of diseases that become more common with age, from heart disease to neurodegeneration to cancer. Drugs designed to rejuvenate mitochondria have shown promise in treating diabetes, and are celebrated as possible therapies for other conditions. Chaudhuri’s team’s findings don’t contradict the role of mitochondria, but expand the theory to include cellular proteins other than DNA. They also explain a condundrum: some long-lived species display plenty of oxidative damage. “We’ve studied a dozen species, half short-lived and the others long-lived. One long-lived species would have lots of oxidative damage, and another would have little. The one thing that seemed to be consistent was protein stability,” said University of Texas Health Sciences Center gerontologist Steven Austad, who was not involved in the current study. 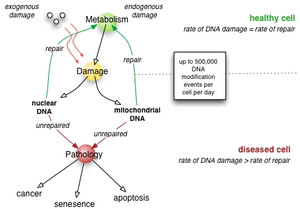 “Until recently I’ve focused on DNA damage and repair, but this strikes me as even more fundamental. For DNA repair to work, you need all the repair proteins to work properly.” Mole rats caught the researchers’ attention because they can live for 30 years, or ten times longer than lab mice, even though the two are similarly sized. Mole rats also appear to delay protein repair until the last possible moment, thus saving energy and resources. When proteins finally do break down, mole rats do an especially efficient job of cleaning them up. Only a tiny bit of ubiquitin — the chemical tag used to label damaged proteins for disposal — is required. Finally, specialized protein-disposal structures, called proteosomes (tied to ubiqitination), don’t appear to break down with age in mole rats. Protein stability and resistance to oxidative stress are determinants of longevity in the longest-living rodent, the naked mole-rat. By Viviana I. Perez, Rochelle Buffenstein, Venkata Masamsetti, Shanique Leonard, Adam B. Salmon, James Meleb, Blazej Andziak, Ting Yang, Yael Edrey, Bertrand Friguet, Walter Ward, Arlan Richardson and Asish Chaudhuri. Proceedings of the National Academy of Sciences, Vol. 106 No. 7, Feb. 16, 2009. Blind mole rats don’t get cancer. in 2011 it was found they have a gene that stops cancerous cells from forming. The same team thought that two other cancer-proof mole rat species might have similar genes, but instead it turns out that they do develop cancerous cells. It’s just that those cells are programmed to destroy themselves if they become dangerous. Mole rats, which live in underground burrows throughout Southern and Eastern Africa, and the Middle East, are fascinating creatures. The naked mole rat, in particular, is the only cold-blooded mammal known to man, doesn’t experience pain, and is also arguably the only mammal (along with the Damaraland mole rat) to demonstrate eusociality — that is, they live in large hierarchical communities with a queen and workers, like ants or bees. 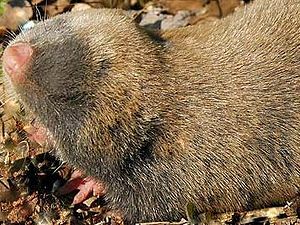 The two species examined by the University of Rochester’s Vera Gorbunova and her team were the Judean Mountains blind mole rat (Spalax judaei) and the Golan Heights blind mole rat (Spalax golani), which live within small regions of Israel. The team took cells from the rodents and put them in a culture that would force them to multiply beyond what would happen within the animals’ bodies. For the first seven to 20 multiplications, things looked fine, but beyond 20 multiplications the cells started rapidly dying off. Examining the cells as they died revealed that they had started to produce a protein, IFN-β, that caused them to undergo “massive necrotic cell death within three days”. In effect, once the cells had detected that they had multiplied beyond a certain point, they killed themselves. The cells of naked mole rats have a self-preservation mechanism tied to a hypersensitivity to overcrowding, which stops them from multiplying too much. On the one hand (blind mole rat) you have self-destruction at a point at which there is crowding due to IFN-β. On the other hand, you find an aversion to overcrowding (naked mole rat). 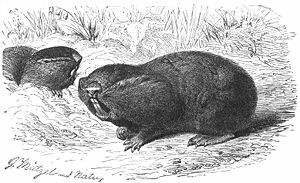 In the Proceedings of the National Academy of Sciences, Gorbunova hypothesizes that the blind mole rats’ unique habitat — almost entirely underground — might mean that they “could perhaps afford to evolve a long lifespan, which includes developing efficient anti-cancer defences”. Blind mole rats have extremely long lifespans by rodent standards, often living beyond 20 years at a time. The reasons why this is, though, are still all hypothetical, as the precise mechanism that triggers the production of the IFN-β is still unknown. The hope is that this research could eventually lead to new therapies for cancer in humans. 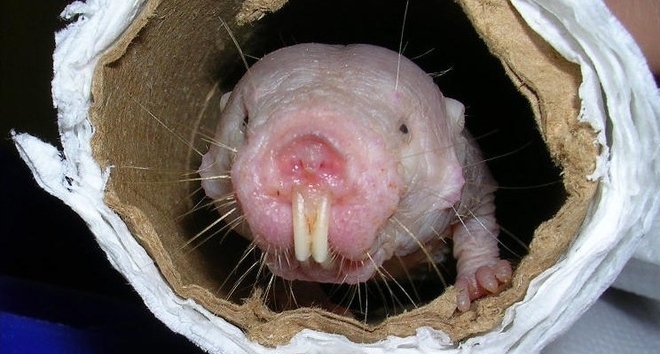 Although they are quite ugly and confined to a life underground, naked mole rats have at least one attribute that other animals, even humans, might aspire to: They don’t get cancer. Now, researchers have discovered that the secret to this rodent’s good health is a complex sugar that helps keeps cells from clumping together and forming tumors. It exists in the spaces between cells called the extracellular matrix, “the work underlines the very important regulatory role of [the] extracellular matrix in cancer,” says Bryan Toole, a cancer biologist at the Medical University of South Carolina in Charleston who was not involved with the study. Molecular and cell biologist Vera Gorbunova of the University of Rochester in New York wanted to take a different tack and focus on animals that seem protected from tumors. So she tracked down the lifespans of 20 different rodents, looking for the ones that live a long time. Beavers and gray squirrels last a couple of decades, but naked mole rats outlive those larger animals by 10 years. 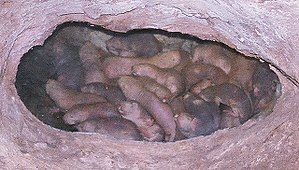 Furthermore, naked mole rats have a unique social structure, with one queen that produces all the young for an underground colony full of helpers. Thanks to these studies, scientists know for sure that this species doesn’t get cancer. Given that naked mole rats live long and are resistant to cancer, “we fell in love with them right away,” Gorbunova says. At first, she and her colleagues did not know where to look for the source of animals’ cancer resistance. But when they grew naked mole rat cells in a lab dish, they noticed that cells wouldn’t get too close together. Furthermore, the dish contents got very gooey, and when they eliminated the goo, the cells would clump together. The researchers tracked the stickiness to a complex sugar called hyaluronan, which cells make and release into the extracellular matrix. Hyaluronan exists in all animals, helping lubricate joints and serving as an essential component in skin and cartilage. However, naked mole rat hyaluronan is unusual in that each molecule is about 5 times the size of hyaluronan molecules from mice, rats, and humans. In addition, the researchers discovered that the enzyme that breaks down this sugar (hyaluronidase) is not very active in naked mole rats, allowing the compound to accumulate to higher concentrations than it does in other animals. The researchers think that this sugar evolved to make naked mole rat skin more elastic and able to cope with the tight squeeze of the narrow underground tunnels. But does it prevent cancer? Gorbunova and her colleagues tried to stimulate naked mole rat cells to form tumors by exposing them to viral proteins that in mice lead to tumor growth. These proteins inactivate genes that suppress cancer, yet still naked mole rat cells did not show uncontrolled growth. However, when the researchers interfered with the production of hyaluronan or revved up the activity of the enzyme that breaks the sugar down, thereby reducing its concentrations, tumors did form in live animals, they report online today in Nature.